This is the first Best Thing on the Menu: Out of Town Edition. BTM took a trip to one of the food capitals of the country – the windy, deep-dish city of Chicago. With one night to shoot for the culinary stars, BTM headed to newcomer Baume & Brix. The concept behind Baume & Brix is that each item on the menu, including desserts, incorporates both sweet and savory flavors. The restaurant is appointed like most in Chicago, with a melting pot of exposed brick, industrial steel and polished wood – a terrific backdrop for a melting pot of a meal. The Best Thing on the Menu: Octopus in the Style of Fun Dip was a treat. 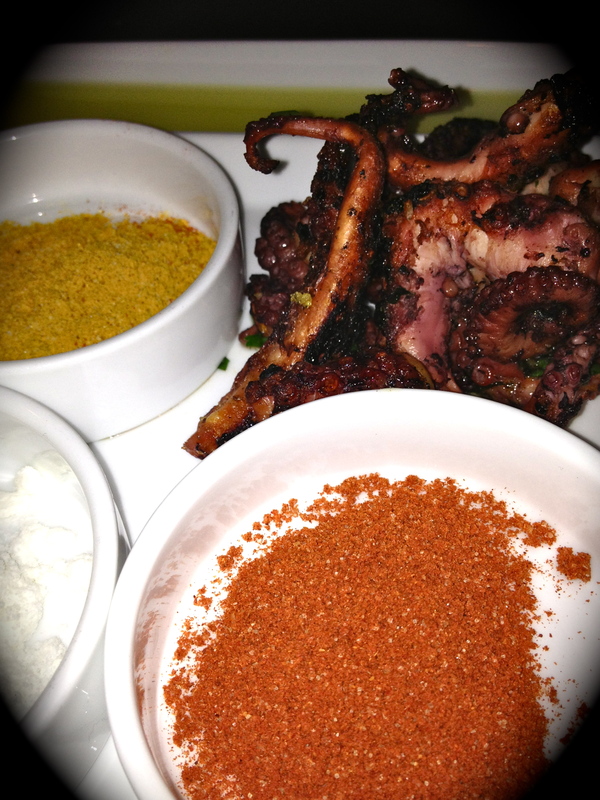 The sous-vide (the clever cooking technique involving vacuum-packed plastic bags) then grilled octopus comes ready to dip in three different powders. First you roll a tentacle in a small trough of olive oil, then you choose between a coconut lemongrass power, spicy curry powder and a smoky umami paprika powder. All are outstanding. While not Alinea or Top Chef owned Girl & the Goat, Baume & Brix is creative, modern, unpretentious and elegant. Adorably, their menu is divided by Explore, Summit, Conquer and Divide. Been to Baume & Brix in Chicago? Share your favorites in the comments section. This entry was posted in Out of Town Edition and tagged Baume & Brix, Best Thing on the Menu, BTM, Fun Dip, Octopus, Umami. Bookmark the permalink.